POW / MIA Flags - Never Forget - Made In The USA! Design: A black and white flag with the silhouette of a gaunt man, a piece of barbed wire, and a threatening watchtower. 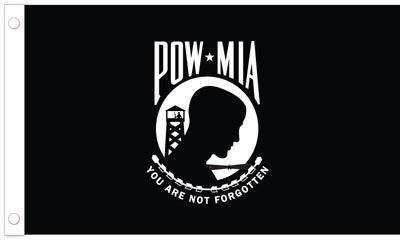 At the top of the flag is the text "POW - MIA" and at the bottom is the phrase "You Are Not Forgotten". 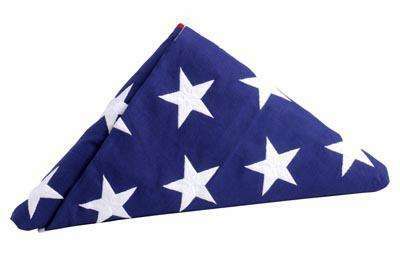 Use Today: Flown to remind the world of the men and women whose fates have never been accounted for after their services in the U.S. military. In 1971, the wife of an American military officer listed as missing in action during the Vietnam War, Mrs. Michael Hoff, came up with the idea for a POW/MIA flag. She believe that it would be a good idea to have a national flag that reminded Americans and the rest of the world of the U.S. service men and women whose fates were unknown during the war. Mary Hoff ordered a flag design from a flag company, who then hired Newt Heisley to sketch a design for them. Heisley was a former WWII pilot whose son had also fought in the Vietnam War. It is said that the man whose silhouette appears on the POW/MIA flag is Heisley's son, whose body had become skinny and gaunt after he contracted hepatitis in service. Supposedly, Heisley's son's sunken features reminded him of what a POW captive might look like after harsh treatment. The flag became very popular, and even though it was not an official flag many families with missing service men and women flew it in honor of their loved ones. When the Vietnam War started to come to an end, over 2,5000 American members of the military were listed as Prisoners of War (POW) or Missing in Action (MIA) by the Department of Defense. In 1979, the United States Congress announced the first National POW/MIA Recognition Day to show the nation's determination to never forget those that gave their lives and freedom to protect their country. In 1982, the POW/MIA Flag became the first besides the American Flag (Stars and Stripes) to be flown over the White House. Finally, in 1990 the United States Congress passed US Public Law 101-355 to officially designate the POW/MIA flag as a symbol of America's concern and resolve to discover the fates of Americans that were still missing or being held prisoner in Southeast Asia. Since then, this flag has continued to serve as a symbol for POW's and MIA's from all U.S. wars. In 1998, The Defense Authorization Act stated that the third Friday of every September would be National POW/MIA Recognition day. The same act declared that the POW/MIA flag should be displayed on this day along with several other national days of observance including: Memorial Day, Flag Day, Independence Day, Veterans Day, and Armed Forces Day. The Act mandates that on these holidays the POW/MIA be flown over the White House, the United States Capitol building, the Korean and Vietnam War Memorials, the office of the Secretary of State, office of Defense and Veterans Affairs, office of the Director of the Selective Service System, every major military installation, ever post office, all VA medical centers, and all national cemeteries. When the flag is displayed on the same flagpole as the American Flag, is should fly directly below it and be smaller or the same size. If the two flags are flown on separate poles, the POW/MIA flag should fly to the right of and be no larger than the U.S. Flag.